Piper Wick left Pickwick, North Carolina at the age of 18 and never looked back. As a successful PR representative, she set her life on course to marry well. A phone call from her Uncle Obadiah's lawyer puts a crimp in her plans. Will her cousins, uncle, and the handsome gardener rearrange her thinking about Pickwick and her relationships? Piper fights to maintain her L.A. persona and keep from slipping into her southern drawl. Author, Tamara Leigh, uses humor and a deft hand painting some hilarious scenes. Will Piper overcome her not-so-happy childhood memories and gain the acceptance she's always wanted? Don't miss this piece of Contemporary Fiction laced with a bit of Chick Lit flavor. 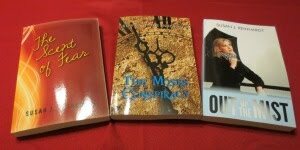 I'm ready to sample Tamara's other books after meeting this delightful cast of characters. Erk! So many books, so little time. Again, this is an author I've heard of and want to try out, just haven't had the chance yet. I just critiqued a Chapter for a book set in North Carolina. The Carolinas are coming up a lot - I even mention NC in my current WIP. I've seen a number of historicals, as well as this contemporary, set in the south. I enjoy the variety of settings the U.S. provides. I think authors tend to choose settings that resonate with their own lives. The author created some engaging characters. I think you'd enjoy this book. There's a scene where she's got a craving for a particular food. Quite funny! I really need to check her out. Thanks for this recommendation! I'm glad you said this was humorous, because I had a hard time with the name Piper Wick in the town of Pickwick. I thought, "You can't be serious." Thanks for the great review, Susan!! The cover sure has a chick-lit feel doesn't it? Sounds like a fun read to me. The book has a humorous side, which enhances the more serious theme. Parts of it were hilarious to me, but I don't know if will strike everyone's funny bone. I hear you. Between trying to read fiction and researching for my next manuscript, it's no wonder I had a headache this week. This book sounds so fun. I love it when writers know how to use humor in their storytelling. Tamara knows how to create eccentric, fun characters. Sounds like a great book! Thanks for the review. God bless! Thanks for stopping by and commenting. I'm working on an interview and giveaway with Tamara Leigh right now. It will be up the end of February.